Kevin de Bruyne has revealed his hilarious first impression of Raheem Sterling, before the pair got to know each as teammates for Man City. The 27-year-old has been blighted by injuries this season, but he remains a fundamental figure in Pep Guardiola’s squad as City target a historic quadruple this year. He’s bagged 40 goals and 62 assists in 170 appearances for the reigning Premier League champions since arriving at the Etihad in 2015, following on from impressive stints at Genk and Wolfsburg. Sterling followed him to Manchester in 2015 and has become equally as important in City’s ongoing pursuit of major honours, but the Belgian international has conceded that he wasn’t sure of the English winger prior to actually getting to know him as a teammate. “Before I came to Manchester City, I didn’t really know what to make of this Raheem Sterling guy,” he told the Players Tribune. “I had never met him, and from what I’d read about him in the English press, I thought he was going to be a very different character. De Bruyne goes on to reveal that they’ve grown close on and off the pitch with their families knowing each other well too, while he adds that Sterling is in fact “one of the nicest, most humble guys I’ve met in football”. There is little doubt that Sterling has proven his class on and off the pitch for City, and is seemingly now changing a lot of people’s perception of him after coming under stick following his decision to leave Liverpool for the Citizens. 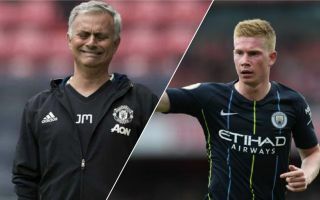 While that relationship is strong, De Bruyne also opened up on what is was like working with Jose Mourinho, who infamously had him at Chelsea at a young age but failed to offer him chances to impress which eventually led to his exit to join Wolfsburg. De Bruyne has revealed that the pair barely spoke, while Mourinho’s promises of a bigger role failed to materialise. “When I was at Chelsea, there was so much in the press about my relationship with Jose Mourinho,” he added. “But the truth is that I only ever spoke to him twice. The plan was always for me to go on loan for a bit. Things have ultimately worked out for De Bruyne as he has since shown his world-class ability for Man City, but he’ll certainly have used that experience to his advantage too in terms of building his resolve and determination to make the breakthrough in England.